Like A Party Bus, Only Smaller…. This is a new category for us: A “Sprinter” is a more compact alternative to a party bus, offering the same experience in a smaller package. If your smaller party is looking to make a big splash, then look no further than our Denver Sprinter Rental! Call (303) 426-9668 or click here to reserve a Sprinter today. Our first sprinter party bus – as luxurious as its big brothers but much more affordable. 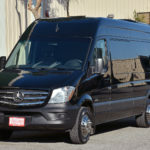 The sprinter is ready and waiting to take your party or event to the next level! Our second sprinter party bus – as luxurious as its big brothers but much more affordable. The sprinter is ready and waiting to take your party or event to the next level! Available from our sister company, Sunset Transportation. Sunset Limos has the largest and highest quality party bus fleet in all of Colorado. We have been servicing the Denver Metro Area for over 29 years and our limos are clean, luxurious and will never “look” cheap. Our professional chauffeurs are courteous, licensed and are trained to make every limo experience the best. But don’t take our word for it; read what our clients are saying about us on Google and Yelp, or click here to read reviews and testimonials from our satisfied clients.